(Bloomberg Opinion) -- Global stocks rallied the most in more than three weeks on Tuesday by rallying 1.10 percent. Many investors said they were encouraged by an agreement in principle among U.S. lawmakers to avert another government shutdown, and by signs of progress on trade talks with China. The takeaway: Equity investors are too easy to please. Perhaps many bond investors are pricing out the possibility of the Federal Reserve raising interest rates this year. “An additional hike is far from guaranteed as the likelihood the economy hits a rough patch in the medium term slowly begins to rise,” the top-ranked rates strategists at BMO Capital Markets pointed out in a research note Monday. Highlighting the deep underlying skepticism toward stocks, global equity allocations in February fell to the lowest level since September 2016, according to the Bank of America monthly survey. The share of investors who believe the S&P 500 Index has peaked jumped to 34 percent from just 11 percent in September. 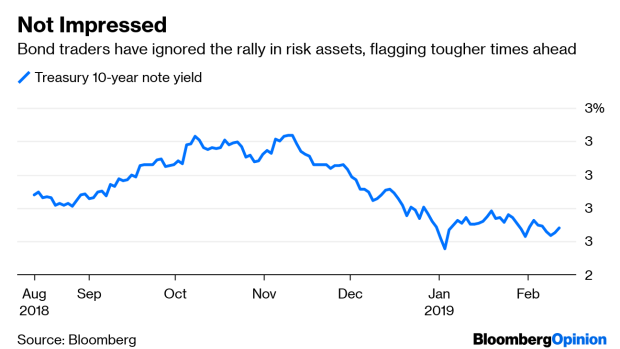 “None of the worries that people had in the fourth quarter have really gone away,” John Carey, managing director and portfolio manager at Amundi Pioneer Asset Management, told Bloomberg News. Some of those worries include concerns about the possibility of a global synchronized economic slowdown, which now may be playing out in the U.S. The National Federation of Independent Business said late Monday that its monthly measure of optimism among U.S. small businesses slumped in January to the lowest level since Donald Trump became president in 2016. The index fell 3.2 points to 101.2, as the net share of companies expecting business conditions to improve in six months declined to 6 percent, the lowest since October 2016 and down from a post-election peak of 50 percent. The percent of auto loans in serious default has risen to the highest level in almost seven years, as consumers with weak credit struggle to make payments despite a still strong U.S. economy and tight labor market. Sentiment is a fickle indicator, but Federal Reserve Bank of New York data out Tuesday showed the amount of auto loans delinquent more than 90 days rose to 4.47 percent of the total in the fourth quarter, the highest since the period ended in March 2012. That’s surprising given how low the unemployment rate is, showing that the economy may not be as strong as thought. Traders keep a close eye on countries’ foreign-exchange and gold reserves as a window into the mindset of reserve managers. And none are more closely watched than those held by the People’s Bank of China, which has made some recent moves that are sure to raise eyebrows. It seems that China has boosted its holdings of gold for a second month, to 59.94 million ounces, or about 1,864 metric tons, by the end of January from 59.56 million ounces a month earlier, according to data on the bank’s website. In tonnage terms, it added about 11.8 tons last month after taking in just under 10 tons in December, which was the first time the PBOC had boosted its hoard since October 2016, according to Bloomberg News’s Ranjeetha Pakiam. It’s always perilous trying to interpret the actions of China and its central bank, but it’s hard not to come away thinking that the sudden affection for gold has something to do with the souring global economic outlook, which in many ways is centered around China. Just this week, Bloomberg News reported that two large Chinese borrowers missed recent payment deadlines, suggesting that government efforts to smooth over cracks in the $11 trillion bond market aren’t benefiting all firms. Overall, central banks worldwide added more gold to their holdings in 2018 than all but one other time as heightened geopolitical and economic uncertainty drove them to diversify reserves, according to the World Gold Council. Emerging markets were swept up in the good feelings that gave risk assets a strong tailwind on Tuesday. The MSCI EM Index of equities rose the most this month while a sister index of currencies rallied for the first time in February. Emerging-market assets suffered greatly last year, and the recent bounce suggests that maybe the sell-off had gone too far, even with the global economy slowing down. As this space has noted before, currency reserves held by emerging-market economies have risen markedly since the financial crisis, to more than $3 trillion, giving them plenty of cushion to ride out a slowdown. Indeed, emerging-market assets have never been as popular as they are now in the history of Bank of America’s global fund manager survey. Investing in emerging markets overtook the U.S. dollar as the most “crowded” trade, a survey of 218 respondents managing a combined $625 billion showed, according to Bloomberg News’s Selcuk Gokoluk. Even as late as last month, selling developing-nation assets was the third most popular trade, according to the survey, which was conducted between Feb. 1 and Feb. 7. The MSCI EM Index has rallied 8 percent this year after tumbling almost 17 percent in 2018. Investors have bought $16 billion of emerging-market equities this year, while selling $26 billion of U.S. stocks and $7 billion of European shares, according to Bank of America, citing EPFR data. Goldilocks, or something more ominous? The U.S. government is forecast on Wednesday to say that the consumer price index rose 1.5 percent in January from a year earlier, down from December’s 1.9 percent gain and the smallest increase since 2016. Stock investors are likely to rejoice because for many, the slowdown in inflation is likely to reinforce the notion that the Fed’s interest-rate hiking cycle is on an extended pause, and the central bank’s next move could be a cut. Riskier assets thrive in an environment of easy money. But such a reaction seems to ignore the real issue, which is that the lack of inflationary pressures is also a reflection of a weaker economy. The last time the bond market was pricing in inflation over the next five years that matched the Fed’s 2 percent target was in October. So-called break-even rates steadily fell, dropping to below 1.5 percent at the start of January, amid rising concerns about a global slowdown. Of course, the drop in inflation expectations coincided with a period of extreme weakness in the stock market.